Christopher Davis holds a HandUp gift card. The gift cards aren’t immediately redeemable at a store, but require the recipient to go into the Project Homeless Connect office. There they can exchange the card for a gift card valid at a retailer such as Safeway, Subway or Goodwill, make payments on bills or buy transit passes. The cards cannot be redeemed for cash. And that matters, at least to Christopher Davis, a homeless man whom HandUp volunteers encountered on an outreach trip to Shotwell and 17th streets last Friday. Davis, who said that he smokes and drinks, said he is mindful of the intention behind the new gift cards. Other recipients thanked the volunteers but asked few questions and while they were enthusiastic, they were also confused about where they needed to go to redeem the card. Katrina Belda, community and support liaison for HandUp, helped test the card system before the release. She said while reactions were mostly positive from those who got cards, many were skeptical. They couldn’t believe someone would just hand them $25, or thought there must be a catch. Which, in a way, there is – ease of redeeming them. 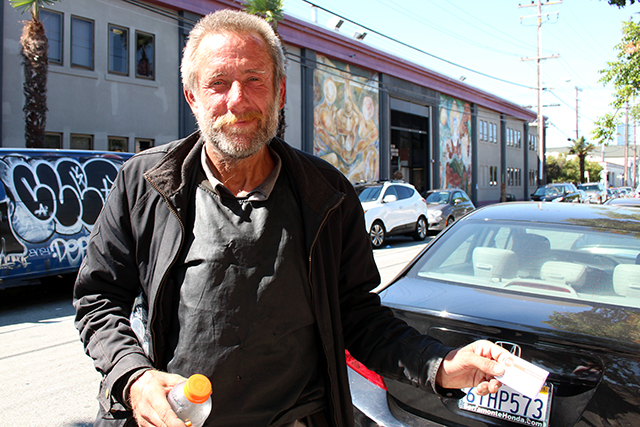 “It’s definitely useful,” said Freddie Wright after receiving a gift card on 16th and South Van Ness during the outreach trip. Wright is hoping to get some new clothing. With a gift certificate to Goodwill, he will be able to do that. “I mean, if you’re giving us the gift card, let me go do what I want with it,” he said. But the detour to the office is actually one of the main purposes of the gift cards – to get homeless people into the system and connected with longer-term services. Nobody who receives a gift card is required to sign up for HandUp services, but it’s one of the goals of the program. During the testing stage, Belda said what worked best to get people to actually redeem the cards and come in to the service center was to have homeless clients already in the system hand out cards to their friends and acquaintances, perhaps relieving some suspicion. Bevan Dufty, who leads the city’s work to address homelessness, said he is hopeful that the gift card program will be expanded to include partnerships with a wider variety of stores, like Target, to increase the options available to gift card recipients. HandUp is not a nonprofit organization. It’s a for-profit company that is making money off the backs of homeless individual. They’re using deceitful tactics like using a “.org” domain name to give the facade of being a nonprofit, but the people who profit off of this are Handup’s owners and investors, like Ron Conway. Hi Greg (Meghan from HandUp here) – sorry for the confusion here, yes we are a Public Benefit Corporation which means for-profit with a legal commitment to social impact. It means we’re a hybrid entity and we can accept venture capital as well as be eligible for foundation grants such as the $500 million grant we received from Google.org. That grant goes toward our member goals (homeless neighbors fundraising on HandUp). We believe this way we can scale faster as any tech company aims to and make a larger impact in the world. 100% of all donations reach the recipient. We do not charge our nonprofit partners (like Project Homeless Connect) to utilize the platform, and do not take a cut of donations. We give donors the option of adding a tip to their donation that goes toward our operation, and over 80% of donors opt in. Regarding the use of the .org domain, we same spirit as Craig Newmark of Craig’s List, which is “It symbolizes the relatively non-commercial nature, public service mission, and non-corporate culture of craigslist.”. (reference https://www.craigslist.org/about/factsheet). Thanks for the input to both Greg and Meghan. I’ve made a correction in the story. Apologies for the mixup.